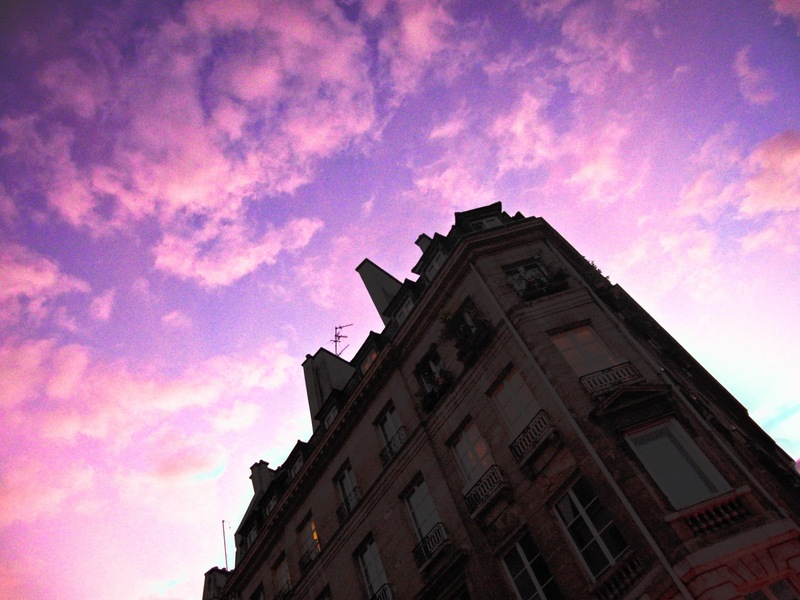 Antoine's flat was in a neighborhood known as Oberkampf in the 11th arrondissement. Most travel guidebooks this year will tell you that Oberkampf is an up-and-coming neighborhood near Place de la République that features good restaurants and bars that have a slightly grungy, contra-tourist, "authentic Parisienne" atmosphere. My personal first impression of the neighborhood differed significantly and was dominated by a string of video game themed stores, one after another. This block in Oberkampf will forever be remembered by me as the Paris Video Game District. The directions Antoine gave us to find his apartment said to turn at the big, yellow "games" sign. The Games District block was dominated by big, yellow "games" signs which rendered these instructions much less useful than we'd originally assumed. After a few missed turns that led us deep into Video Game Land, I was more or less unsurprised when I saw that the view from the front door of Antoine's building was a life-size image of Link from the Legend of Zelda wielding a sword. The block would have been heaven for a twelve year old boy. When we arrived at chez Antoine, we were given keys from a girl named Julie who was dutifully waiting on the stoop. Julie didn't say much to us besides a polite "Bonsoir!" We never actually met Antoine and we never saw Julie again. We decided to stay in a flat in Paris because we were going to be there an entire week and it turned out to not be much more expensive than a hostel. It certainly felt far more glamorous to have our own private residence. The flat itself was a cozy, top floor studio with a back room that someone (who I would venture is Antoine's main squeeze) was using as a small workroom for fashion design projects. It was filled with scraps of materials, old portfolios and box of g-strings. The kitchen was small and cluttered; its wooden floor sloping severely. The angle of the floor was so pronounced that the doors of the banquet hung wide open, causing night time bathroom runs to be alarmingly hazardous to our travel-weary knees. I tried to keep them closed with rubber bands, but when the rubber bands both snapped I grudgingly accepted that the doors were simply happier swinging freely. (Liberté.) For a French kitchen it was shockingly under-supplied. It seemed to be more or less unused except for the preparation of a number of fancy-smelling herbal teas which were clustered by the sink and microwave. The kitchen was stocked with a box of potatoes and onions, but I suspected that they had been largely forgotten about; the potatoes had sprouted a labyrinth of offshoots before reaching a nearly liquified state of decomposition by the time I found them. The main room served as both a common room and a bedroom; neither area was separated from the other by anything but logical space. There was an old leather chair in a state of such disrepair that we were sure the bottom would drop out of it at any moment. It was alarmingly comfortable. The bed was a full size mattress laying on the floor in the far corner of the room. There were two windows, both of which opened widely to the chilly September air of Paris. On the wall was taped a set of Polaroid photographs of other photographs of models posing in that avant-garde, high-fashion sort of way. I amused myself by taking photos of the photos of photos while marveling at the meta levels of recreation like staring into a mirror with another mirror at your back, trying your damnedest to see what infinity looks like.